Jama‘a in Arabic means to collect and put things together, as in, “Men said to them ‘a great army is gathering against you’ and frightened them” (AL-I-‘IMRAN, 173); it may also mean to make up one’s mind and come to a decision. Allah says,“And they all agreed to throw him down to the bottom of the well”(YUSUF, 15), “Say, if the whole of mankind and Jinns were to gather together to produce the like of this Qur’an, theycould not produce the like thereof, even if they backed up each other withhelp and support” (ISRAA’, 88). The GATHERER is one of the names of Allah; “Our Lord! Thou art He that will gather mankind together against a Day about which there is no doubt” (AL-I-‘IMRAN, 9); Heis the GATHERER of similar, dissimilar and contradictory things. He gathers similar things by gathering people on earth, and gathering them all in one place on Doomsday. In the universe, Allah gathers dissimilar things by gathering the stars, the heavens, earth, seas, rivers, plants, animals, insects and various metals; all these things are dissimilar in shape, size, color, and characteristics. He also gathers all dissimilar things in one thing, such as bones, flesh, blood, nerves, hair, and nails in the human body. Another example is gathering the stem, the trunk, the leaves, and the fruits in the plant. As for the contradictory things, Allah, Praise and Glory be to Him, gathers heat and cold, moisture and dryness in the bodies of the living beings. Moreover, He gathers the positive and negative charges in both electricity and in magnetic powers. Even the air we breathe in contains oxygen and carbon dioxide. The elaboration of the Power of Allah, the GATHERER, can not be perfectly known without knowing the details of every collective form of His Creation. 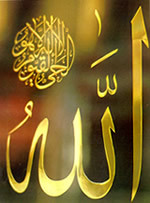 Allah, the GATHERER, can not be perfectly knownsave by Him, Glory be to Him, Praise and Glory be to the GATHERER, He isAllah.